Boy did I make a mess today as I was making a card for Mojo Monday. I thought that this square card it would be perfect for a Valentine’s Day card. 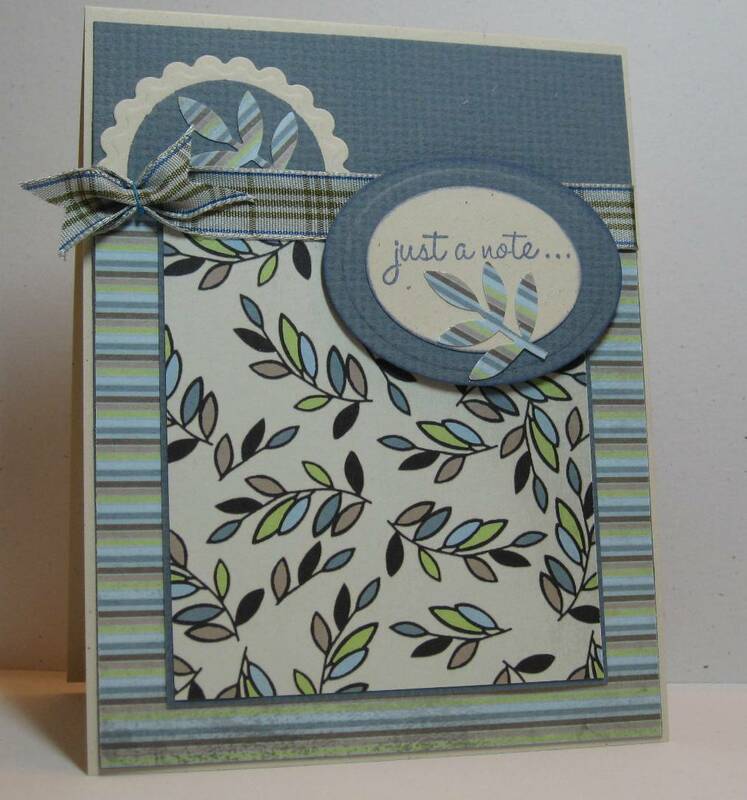 I started with some beautiful designer paper from a DWCV matstack, then worked everything else around it. 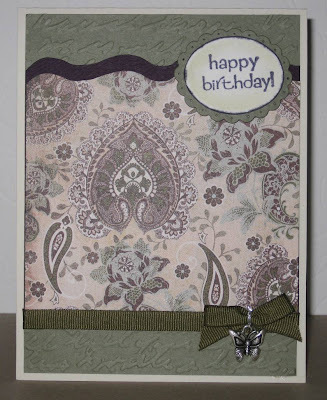 The designer paper is covered in pretty flocking that gives the whole card a textured look. 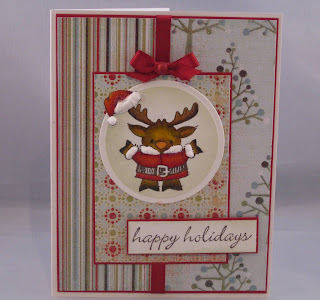 I finished with a heart die cut that I pressed into Versamark then sprinkled with Ranger Red Tinsel Embossing powder. I did the same with the small hearts that are from a small punch I have had forever. 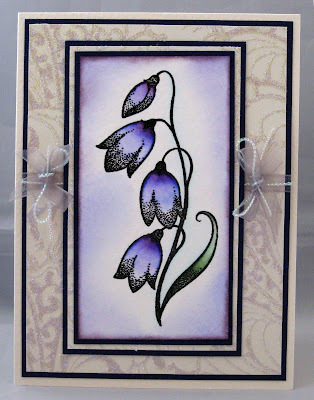 The embossing power has a nice sparkle that does not really show with this image. The center square is popped up with foam tape and the heart has two layers as well.﻿ I used the Slice- Holiday Expressions for the BeMine, I used a thin black paper with sparkles in it for extra effect. 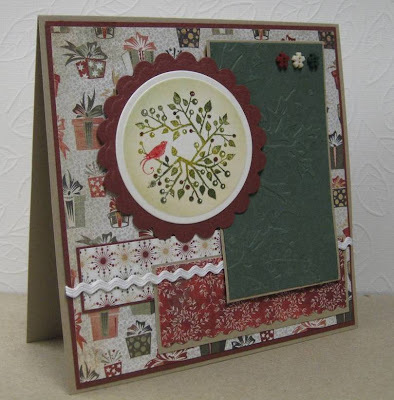 Supplies: Natural Ivory and tan cardstock, Designer paper – Misc gold and DCWV-La Creme matstack, Slice-Be Mine die cut, Spellbinders-Decorative Photo corners, Stampin' Up!-circle punches, Ranger Red Tinsel Embossing powder, misc red ribbon. Hello-Hello, I can't believe I skimmed by Christmas and that the New Year is zipping toward us. I am smack in the middle of a wonderful break. Today I am cleaning carpets and putting away some Christmas stuff. It is a new Mojo Monday this week, the last of the year and I am excited to hide myself away this evening to see what I can come up with. I had a couple of amazing days up at Mt Washington, they say they have the most snow in the world right now for an Alpine Resort, not sure how accurate that is but I have to say it sure was pretty. We are so fortunate to live only a few hrs away. 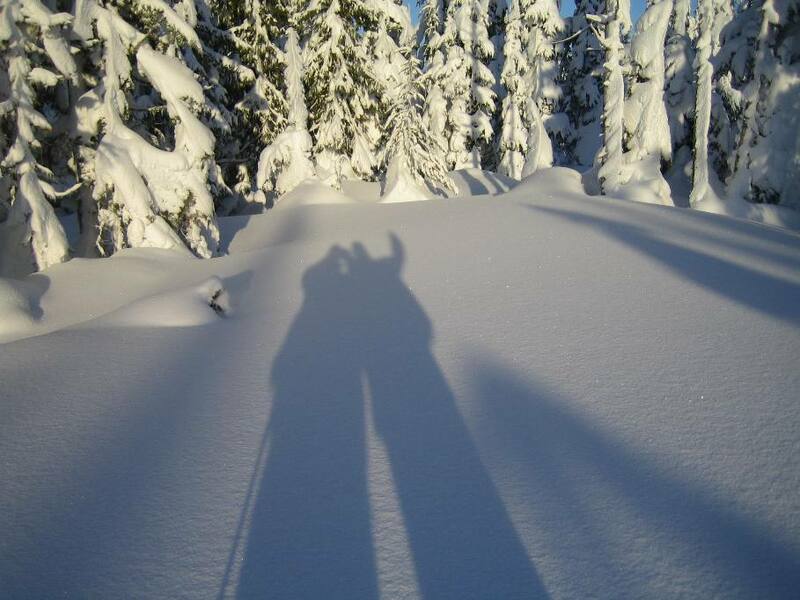 We are not skiers but love to Snowshoe and our first day there was a true winter day with thick fluffy snow coming down, we had a wonderful 2+hr shoe, most of it making our own trails. A visit is never the same without saying hello to the Whiskey Jacks and they did not fail to delight us this trip either. I imagine these this guys would not be welcome in a camp, they are friendly but crafty at getting the goods. 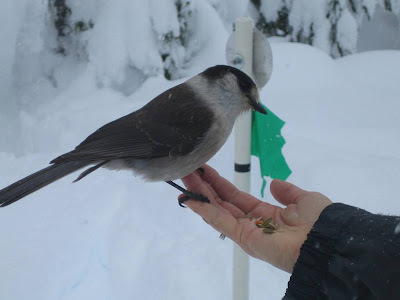 We always take a little extra trail mix to share with them, this year they loved the big plump raisins, but did not think much of the small square papaya bits and just picked them up and tossed them off my hand. 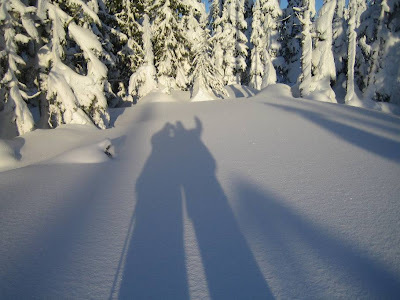 The second day was magical, the sun was out, it was crisp and there was a very light breeze which picked up some of the fluffy top snow and wisped it away so that the air looked like it sparkled. I love Mojo Monday's, thank you so much Julee and your team. Although I have only participated in a handful of Mojo Mondays, it is now a part of my week that I look forward too. My husband even surprised me with mentioning it to me this week, knowing I was going to lock myself away to create. I surprise myself each time with actually getting something made. I used this Just a little note stamp from the Fiscars- Just Between Friends clear stamps set. I have been foraging through my many bins of Designer Paper to find the papers I loved when I brought them but have since gotten lost in the shuffle. I found a small stash of Upsy Daisy Designs double-sided paper that have been serving me well the last few cards. 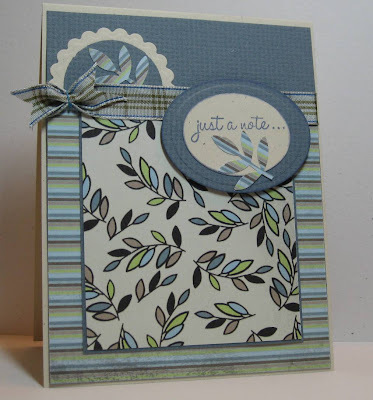 Supplies: Natural white and blue cardstock, Designer Paper-UpsyDaisy Designs, Fiscars-Just Between Friends clear stamps, Martha Stewart- Frond Branch Punch, Spellbinders- Large Classic Oval and Classic Scalloped Circles Small, Basic Grey Ribbon. I wish the weekend was not over, I could have used an extra day. Not because I am busy, I finished wrapping all the Christmas gifts this morning, but because it is the time of year when my internal battery is low and you just need that extra day(or a holiday:)). I have two holiday luncheons this week which even though it may only be an hr a day, it breaks up the day nicely and over all makes time move quicker. This card is just random, I have no plans for it, it was not made for anything specific. I just wanted to make a card, and I have wanted to ink up this stamp from the moment I brought it... for $2. I don’t know who made it but I love it. I don’t know how many tree stamps I have(too many I am sure) , nor do I want to count them . I just love nature stamps. 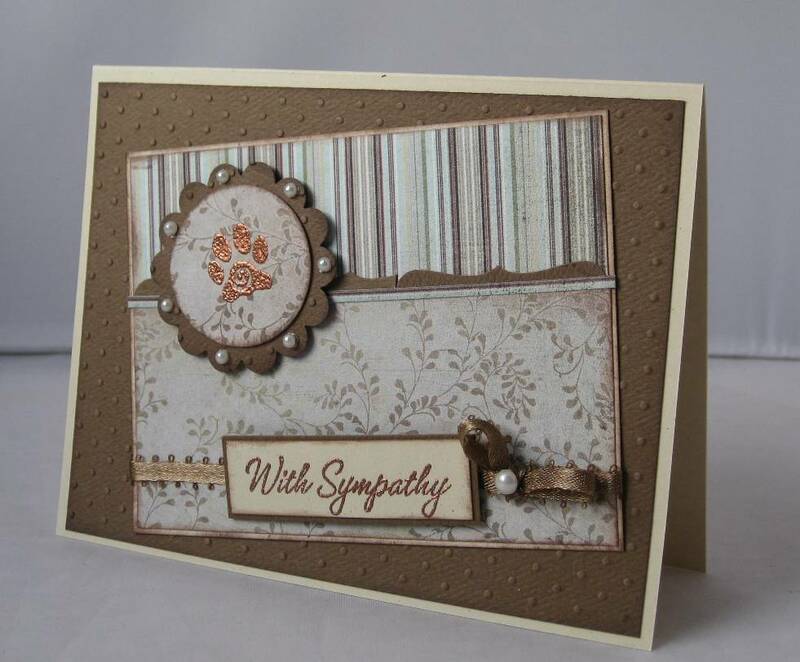 Supplies: Brown and natural ivory cardstock, Designer Paper- Upsydaisy Designs- A Walk in the Park, misc tree stamp, Elan brown ribbon, Kaisercraft-brown pearls. 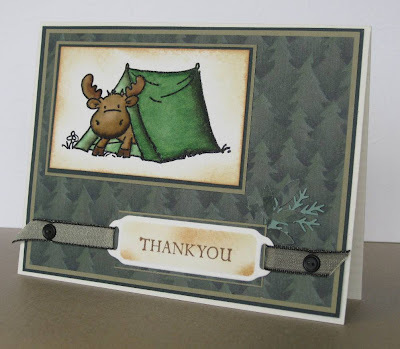 I think this Penny Black stamp is so cute, I thought it was perfect for this Winter Themed Thank you. Opps, I missed yesterday’s post. Darn, behind again :). I have another Christmas card for this evening. I used Rangers Queen's Gold Embossing Powder with the Season's Greeting Stamp that is a beautiful gold colour that matches the gold shimmer cardstock layer. I finished it with a light brown sponged edge. Supplies: Cream and brown cardstock, Gold shimmer paper, Designer Paper-Cosmo Cricket Wonderland-Holly’s Berries and Pinecones, Inkadinkado-Seasons Greetings, Ranger Queen’s Gold Embossing Powder, EK Success Zig Zag Punch. Wonderful Mojo Monday, I step a little outside my comfort zone for these challenges and I love it. I also had the chance to play with my new Slice. No card today :). 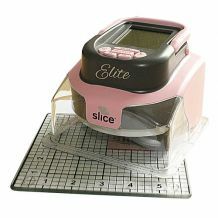 I love Michaels Crafts today, I love that its currently a 40% off Slice and Slice Accessories deal. I have been debating on whether I really needed this item, so many times in the past I brought must have items that I really did not need. 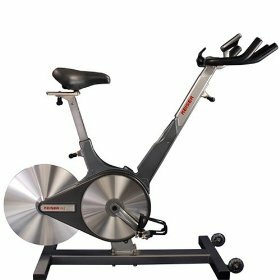 I hummed and hawwed and hummed some more, checked out Ebay for deals and decided I would wait.... Till Michaels put it 40% off the machine and all accessories. Happy dance, I own a Slice, with the help of my loving husband. I locked myself away for a few hrs with my audio book and craft supplies and churned out 9 cards last night, all of them Christmas. They were not all indivigual designs, only 2 new. I love the Magenta Crafty Individual stamps and this one work perfect with the glittery Bo Bunny designer paper. I used Vineyard Berry embossing powder from CTMH. The finishing touch was a small clear gem in the middle of the punched snowflakes. 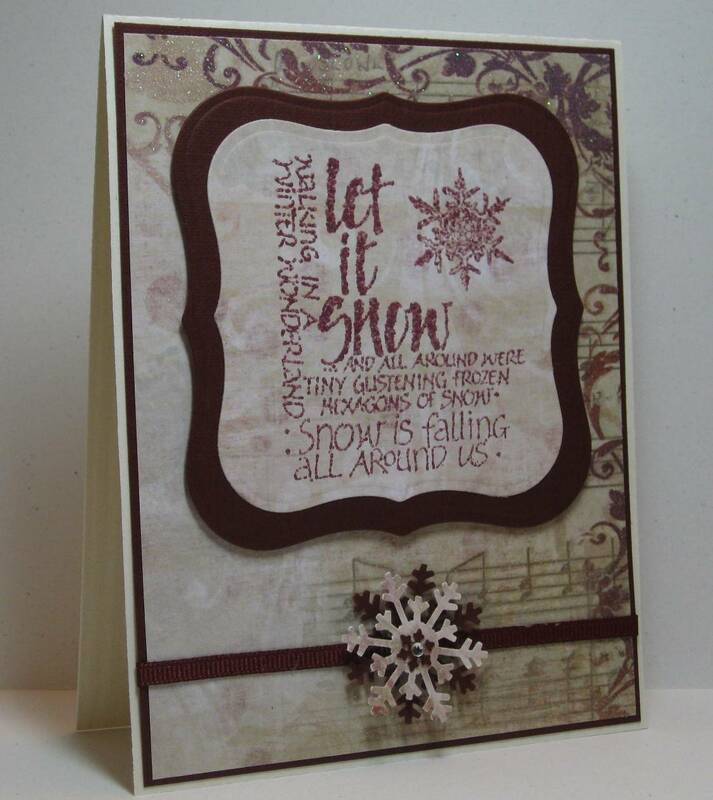 Supplies: Cream and burgundy cardstock, Designer Paper-Bo Bunny-Snowy Serenade Overature, Crafty Indiviguals-Let it snow, misc ribbon, Martha Stewart-Snowflake punch, clear gems, Close to my Heart-Vineyard Berry embossing powder. Dec 10, wow, next week begins the slow down slope to Chrismas for me, we have been to a Christmas party or two but I have 4 or 5 different lunches with work. It breaks up the day so nicely. 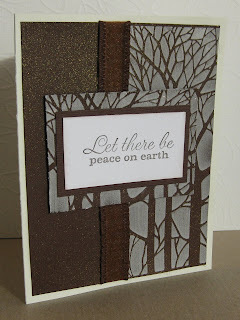 This is the final Dreamweaver Bare Branches stencil card from the class. I have altered one of the four cards from this class to use as one of my Christmas cards, I will post that in a day or so. I am so glad that I am past the middle of the week and I can't wait for the weekend. This is number three from the workshop. Supplies: Cream and brown cardstock, Dreamweaver Embossing paste, Heritage Farms Merry Christmas, Dreamweaver stencil-Bare Trees,Krylon-18kt Gold Leafing Pen. And today I am eight for eight :) I am doing the little happy dance Mrs. Miles. 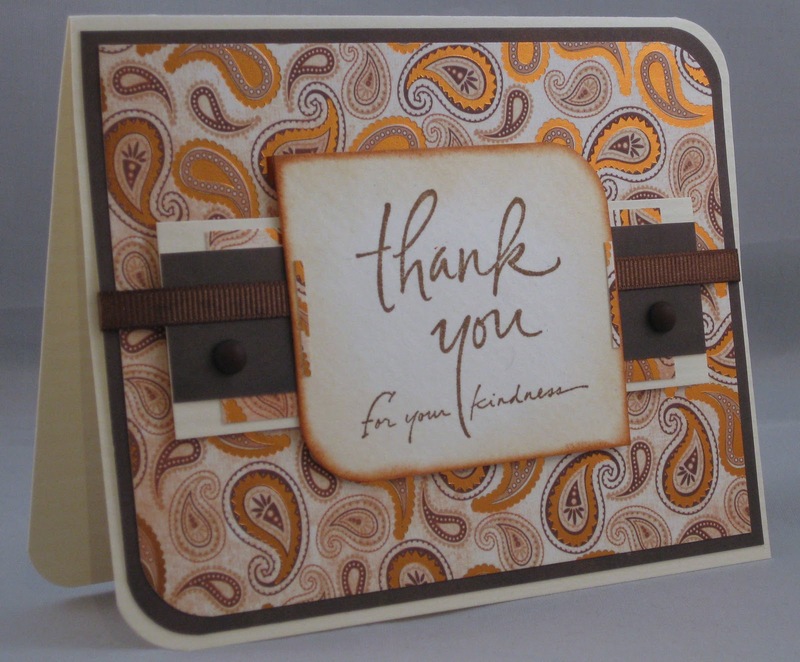 Today is a quick thank you card. I wanted to try a curved corner design, I though it worked well with this simple card. This designer paper has a lot of bronze coloured foil that you can see a glimmer of in the upper right hand corner. Supplies: Cream and brown cardstock, Designer Paper-s.e.i- Charlemagne, Inkadinkado-Thank you, Offray brown ribbon, Pink Pebbles - brown candy dots. Quick second card post, still 1 behind on my sisters challenge darn it :). This card is number two from the class. I took a class at one of the local Scrapbook Stores a few weeks ago, I think the cards we made are pretty stunning. The Technique is using Embossing Paste and Stencils. I have seen cards done similar to this before but I was pretty happy to find out how it was done. Some steps had already been done for us such as cardstock cut and spritzed. The brown cardstock was spritzed with gold sheer Shimmer Spritz and this was the first time I have used a gold Leafing pen, I am pretty impressed with the look. We were recommended to use a Spellbinders Magnetic Spacer under a piece of paper to hold the stencil in place, and it worked like a charm. I used a plastic putty spatula to apply the paste, I then carefully pealed the stencil away and sprinkled warm highlights glitter on it then set it aside to dry. It took about and hr to dry. We were told that all the sentiments stamps were from a retired Heritage Farms set(I would have bought it in a hearbeat). I did feel a bit rushed, what card class isn't but I would have like to clean up the edges and such before putting it all together. I used this stencil for one of my Christmas cards. We did a set of 4 cards in the class, and to try to post every day I will share over the next couple of days. A second post and little Mojo on a Monday. I am going to keep this simple as it is my second go on my blog today. This is my try at it, my creativity has taken a little dive after all the Christmas cards. When I am creatively challenged I always fall back on more masculine cards. This is for my son's birthday. I added a little brown Spica Glitter marker to the Happy Birthday and the wee little owl square is popped up with foam tape. 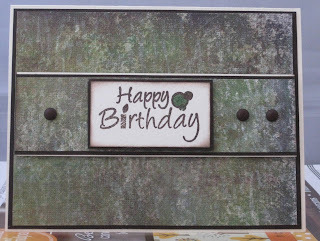 Supplies: Cream and brown cardstock, Memory Box-Twiggy 6x6 Collection, The Artful Stamper-Happy Birthday, Memory Box-Budding Branch, Martha Stewart-Branch Punch, Pebbles Inc-brown candy dots. A big Happy Birthday wish to couple of wonderful Forsyth boys. Have a wonderful day Bill and Barry, I hope you are both spoiled today. Sometimes a simple look just works, I tried to catch the shimmer and sparkle of the cattails in this picture. I know that cattails are not suppose to sparkle but in my world they are beautiful so why not let them shine. 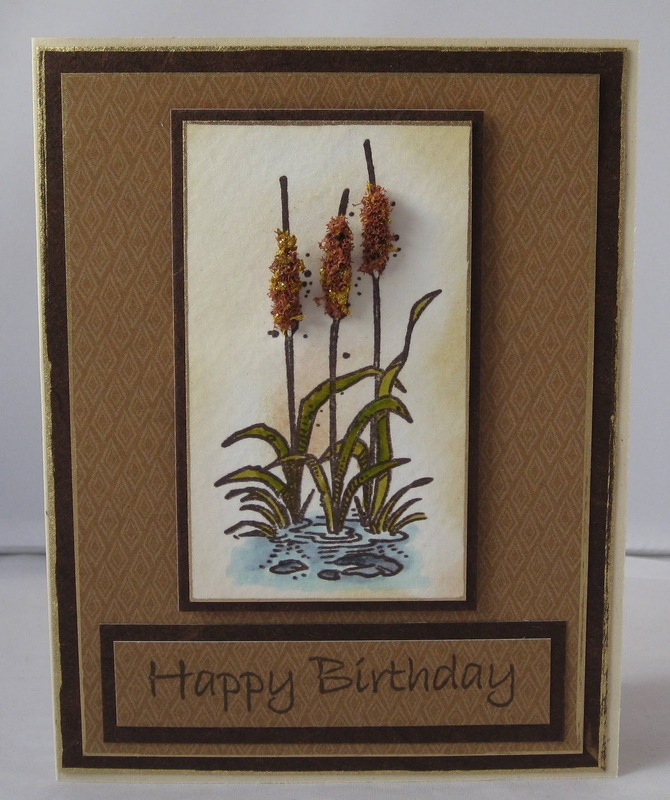 I first created the Cattails by using Flower Soft Wire and rolled the end of the wire in Flower Soft high tack glue, then rolled it in a mix of Gold and Nut brown Flowersoft and glitters pressing softly to make it all stick before it could dry. I stamped the image then created a small hole that I fed the wire through it so that it was hidden, I used tape on the back to hold it in place. I coloured the rest of the image with a mix of Tombow markers and Spica Glitter markers. 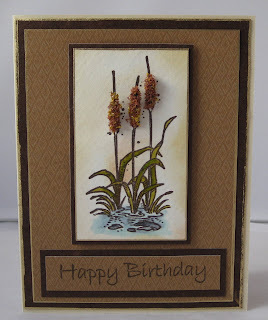 Supplies: Cream cardstock, brown mulberry, K&Company-Recycled Earth brown Mat Pad, LasVegas stamps-Cattails, The Artful Stamper-Happy Birthday, Flower Soft-Gold and Nut Brown, Jewel Glitter Ritz-Sahara and Bronze, Flower Soft wire. As I was getting ready to post this, I realized that I had forgotten to take pictures of some card that have already gone out in the mail, it must have been one of my many scatterbrain days. I am hoping to post something for Mojo later. I think this stamp is so fun. I coloured the image with my Spica Glitter markers and used Perfect Puff for some of the icing. Supplies: Cream and purple cardstock, Designer Paper-Unknown, Stampendous-Birthday Cake, Spellbinders-Curved Rectangle, Kaisercraft Gems, misc purple ribbon, Perfect Puff. Check out my very talented sister Barb, she is back in a store with her amazing designs. Check out Scrapbook Elements. This is going to tie this post in with my earlier post, scraps. I gave my sister a folder of my scraps, most were half sheets of patterned papers that I just did not think I would use. So this summer when I was visiting we sat down to do some cards. 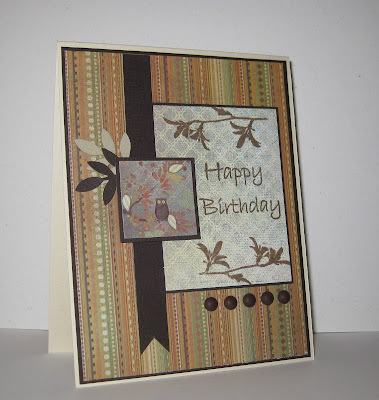 The first place I found patterned paper to use for this card was that scrap folder. Note to self ‘Dig through my scrap bin more often’. I cut the cute little Birthday hats out and popped them up to make them 2 dimensional. I coloured hats and gift box with my Spice Glitter pens. Supplies: Cream and Pink cardstock, misc patterned paper, Fiskars Birthday Party clear stamps, misc pink cord. There is no way I will be able to keep with the challenge from my sister Barb, she is going to post daily for the month of Dec. I am already behind with today being the 4th, maybe I can post twice in one day to catch up :). I think that will count. This was a quick card, I found this patterned paper in my scrap bin and though it would be perfect for a simple card. I really should dig deeper in my scraps, I might just find treasure. 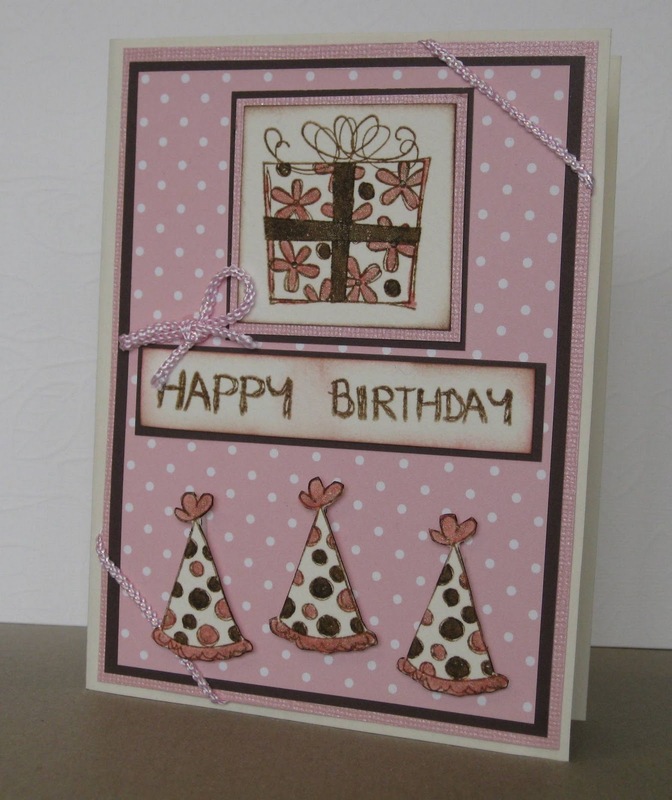 Supplies: Brown and cream cardstock, misc patterned paper, Inkadinkado-Birthday wishes, Pink Pebbles Candy dots-Brown. I am still trying to make my way through Christmas cards so I will continue with the Christmas/Holiday Season theme.﻿ I have never been able to pull off a round card, so I have given up trying. This card just sort of flowed when I was putting it together. I layered Bo Bunny designer paper, then stamped Stampin’ Up! Serene Snowflakes with Versamark and embossed with clear embossing powder, I sponged over the snowflakes with VersaColor Turquoise. I used Spellbinders Snowflake Wonderland Shapeabilites to die cut snowflakes rather then stars. I finished it all with some Bo Bunny gems. Supplies: Off-white and turquoise cardstock, Designer Paper-Bo Bunny Snowy serenade winter night, Snowy serenade crystals, snowy serenade, The Old Island Stamp Company- Merry Christmas, Stampin’ Up!, Serene snowflakes, Spellbinders Shapeabilities-Snowflake Wonderland and Standard large circles, Bo bunny jewels. I cannot believe that it will be Dec 1st tomorrow, this year has flown by way too fast. Isn’t this stamp the cutest, it makes me happy to look at it. It was also perfect to try out my tombow marker techniques. I used Clear Star Gelly roller on the bee's wings and the rain drops to make them all shimmery, it fits well with the shimmer of the Cloud9Design-Sparkle April's Floral Confetti paper. This is a birthday card for a little someone who turns 3. Supplies: Cream and shimmery sea foam cardstock, Designer Paper-Cloud9Design-Sparkle April's Floral Confetti, Stampendous-Bee Showers, Kaisercraft Pearls and misc ribbon, pink embroidery floss. A little Mojo Monday on a Tuesday. 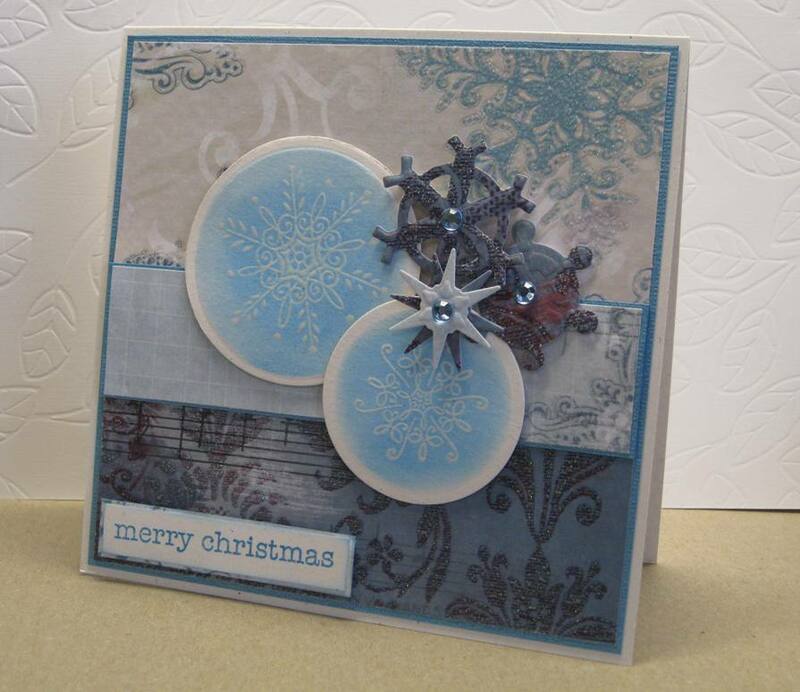 With Victoria having a nice little shot of winter is sure helps with the Christmas and wintery cardmaking ideas. I am behind on my Christmas cards so I figure if I am going to enjoy the fun of Mojo Monday then I will stick to Christmas themes for now. I fell back to my love of Memory Box designer papers and used three of my 6x6 pages to put this card together using non-traditional colours. This is this week’s sketch. This is what I came up with, I tried to stick to the sketch as close as possible as I usually don’t do very well at the sort of thing, I never follow a recipe for cooking either. 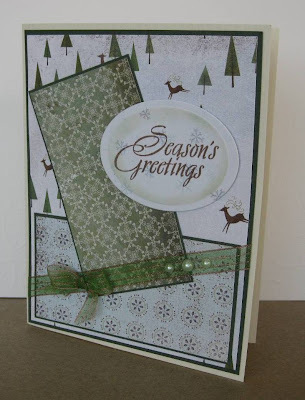 Supplies: Green and cream cardstock, Designer Paper-Memory Box Frost, Stampendous-Winter Trees, Spellbinders-Large Classic Oval, Kaiser Craft-Pearls, misc shimmery ribbon. 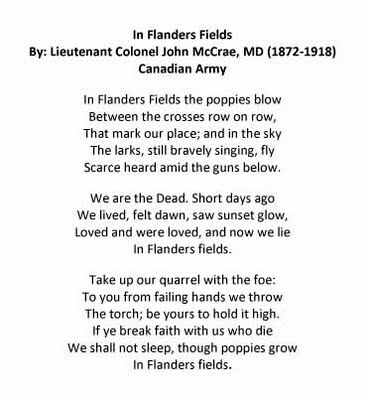 Thank you for the comments, they are always welcome. Hop on over to my sister Barb's and SIL Judy's blogs to see their wonderful Mojos as well. Whew.. Way Way behind on the Mojo this week. I have good excuses, card classes, Christmas cards, husband hogging the office/craft room. I did manage to make a Mojo Monday card... on Thursday but I have not had a chance to snap a photo till now. This is my try at it. 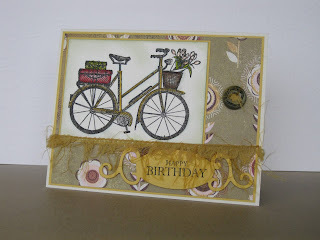 I used my Cuttlebug Swiss dots embossing folder on the scalloped circle and background layer. 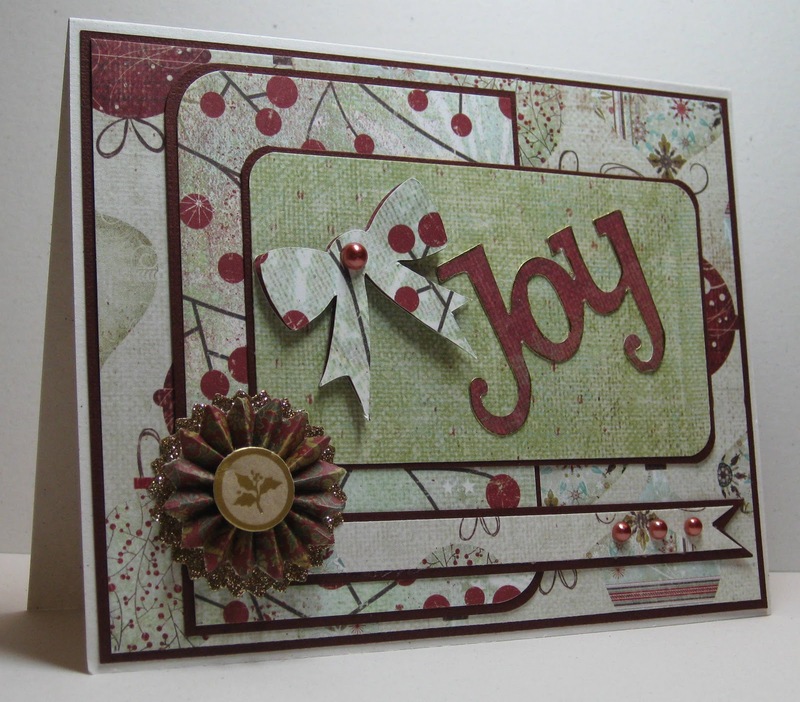 I used Stamping up punches for the circle and scalloped circle. I stamped a cat paw on some designer paper. We had a friend who lost a dear friend - Pickles. We are having a little bit of winter today.First snow of 2010, being as we usually don't get much of a winter here is always causes a stir. Yup a whole skiff :), mind you some areas of the island did get a lot more of the pretty white stuff. 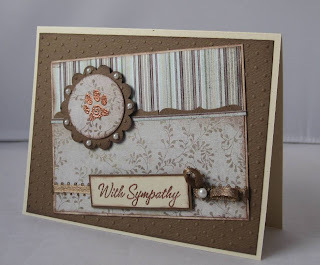 Supplies: Creama and Brown cardstock, Designer Paper-Basic Grey Cappella, Stampin' Up!-With Sympathy, Pink Cat Studio-Glamour Puss, American Craft brown ribbon, Kaisercraft-Pearls. This was a great stamp for me to play with my tombow markers. When I first tried my hand at Scrapbooking, and failed in my mind I brought a few of the Provo Craft Bitty Scrap pads. Every once in a while I pull them out to see if I can make anything with the papers, in this case a page from the Nature Works pad was perfect for a masculine Thank you card. Supplies: Cream and green cardstock, Designer Paper-Bitty Scrap Pads-Nature Works, Hanna Stamps-Tent Riley, Martha Stewart-Branch and Frond Branch punches, Spellbinders-Double Ended Tags, misc ribbon and button brads. 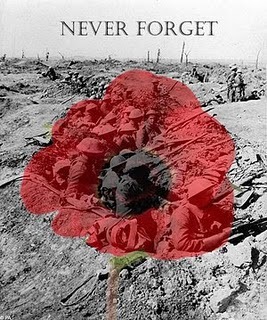 Wear a poppy, visit a local cenotaph, attend a service or a the very least a minute of silence. Remember our solders. Good Morning, I am so happy it is Wednesday. It is the last day of my work week and it is my last short week before the long hall to Chrismas (44 days) I think till the big Dec 24. I have a friend who is an avid cyclist so when I brought this stamp I had her in my head. I think it so pretty and girly. Not made for speed Lisa but for scenic rides for somewhere like Tuscany. 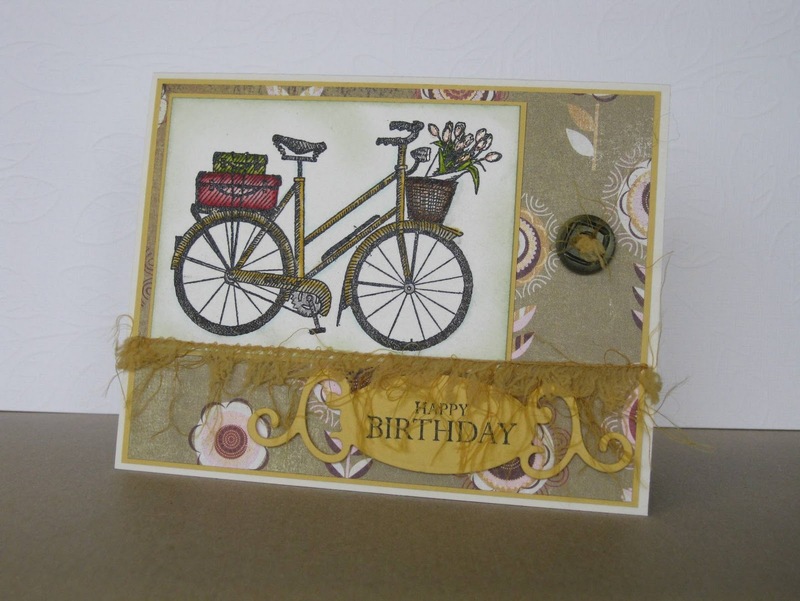 The frame of the bike has a sparkle as I coloured parts with my clear star gelly roller. The rest of the image I used my Tombows. I brought this pack of fibers, I think Basic Grey? ?, I went looking last night for them and they are no where to be found. 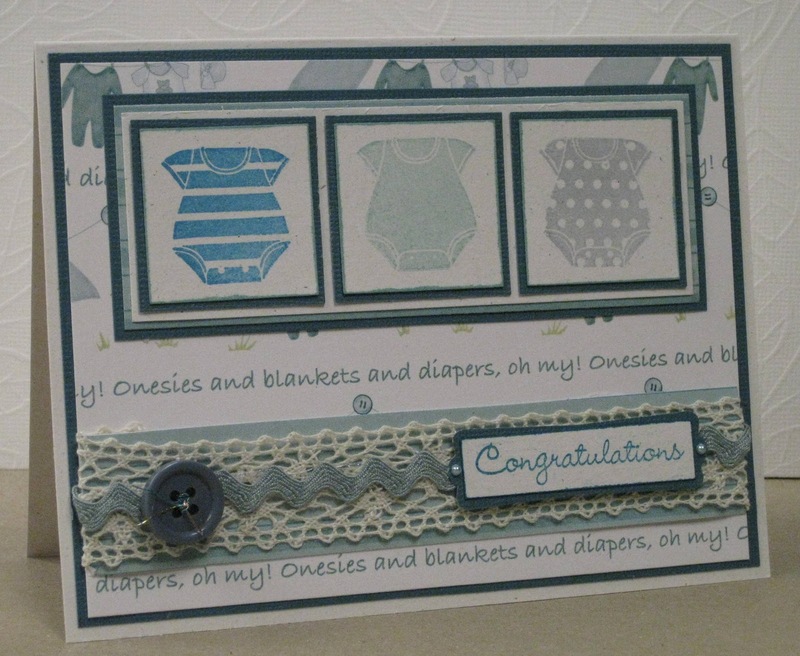 Anyhoo this little shag bit worked perfect for this card, my sister gave me a jar of old buttons and I found a great match, pulled a little extra fiber through and Voila. 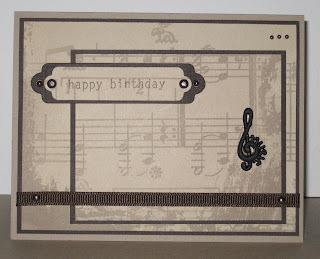 Supplies: Cream and Mustard cardstock, Designer Paper-Basic Grey-sugared/beauty, Inkadinkado-Amsterdam Errands, Spellbinders-Fancy Tags, Gina K Designs-Happy Birthday, Basic Grey fibre and misc ribbon. Thank you for those who comment, it makes my day. A quick post this evening, I was really looking forward to today's sketch. I needed a little boost to my Mojo :). I have all these wonderful papers and none of them have been inspiring for me. Tonight I did OK. This is my take on it, I can sew but not on cardstock so that element is missing in my version. I added glitter to the Perfect puff and I still like how it turned out, I was also able to work on my Tombow skills. 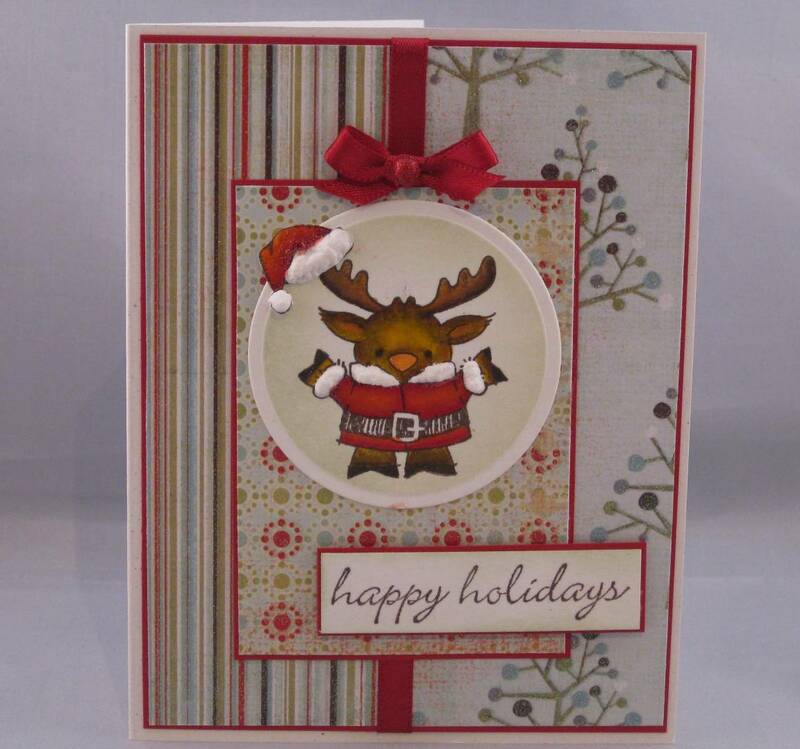 Supplies: White and red cardstock, Designer Paper-My Mind’s Eye-Wonderful Winter, Stampendous-Short Moose, The Old Island Stamp Company-Happy holidays, The Artful Stamper-White Perfect Puff, Glitter Dome – Red Glitter sticker, Fabricland-red ribbon. Just a quick post in the middle of busy-ness. I have two banana loaves to put away, and some cornbread to go with the big pot of Spicy Potato soup cooling on the stove for tomorrow night's dinner. I had so hoped to card tonight, I have the cutest new My Mind's Eye paper called Wonderful Winter I wanted to play with but am too tired to be creative. So I will post another card that I used My Mind's Eye-Fall in Love to create. This paper has such pretty glitter and it makes it so easy to build the card around it. 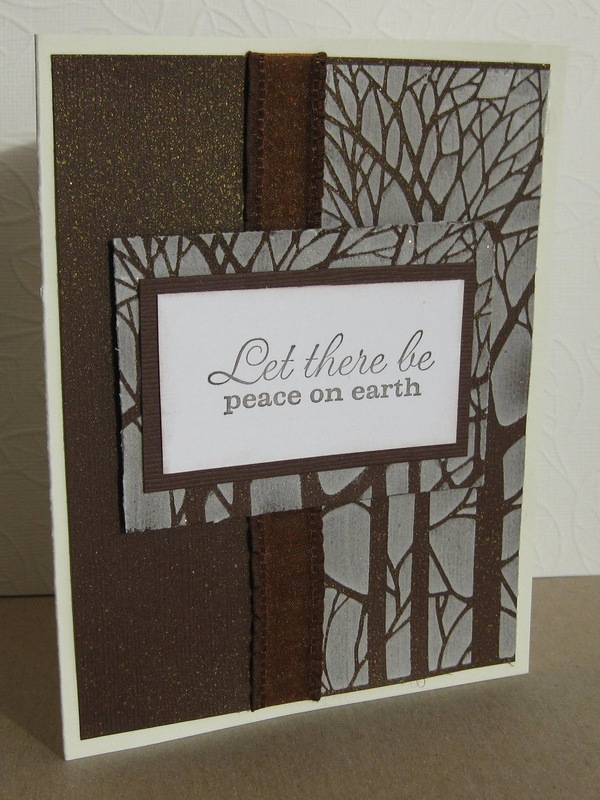 I used a couple of layers, embossed the Windswept leaves with Craft Essentials Copper embossing powder, added a simple fall stamp and finished with ribbon. Supplies: Cream and brown cardstock, Designer paper-My Minds Eye-Fall in Love, Stampendous-Seasonal Swirls, Inkadinkado- Windswept leaves, misc ribbon,Craft Essentials embossing powder. It's Mojo Monday time again :). I think this card just may end up being a template for one of my Christmas cards, it is a little more time consuming then I would like for making 1/2 dozen of them but... anyhoo this is the sketch. 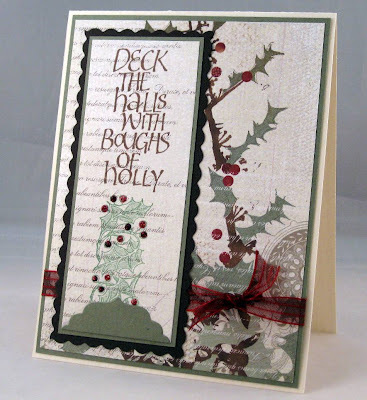 I love this stamp, loved it when I brought it, loved it when I was stamping with it, the holly and the Calligraphy are actually side by side but there is just enough room to ink the sides separately. I of course continue my love affair with Memory box Designer Papers too :). I found that in my small army of Spellbinders I don't own a rectangle scallop (is there one? I may have to do some shopping)I used my scallop blade on my Fiskars trimmer and liked the cute little odd cuts at the corners too. I dug into my stash of what I think of as my Christmas ribbons, beautiful and shiny. I finished off with some Stickles and Voila. I needed my design to be upside down so it would not cut of the words but I think it works just fine. I am still working on the card pictures, I have had some wonderful suggestions for natural light and so one, it had been a little gloomy and rainy here though so no outside picture taking for me. Supplies: Brown and sage green cardstock, Designer Paper-Memory Box Holly Jolly, Magenta Crafty Individual-Calligraphy Deck the Halls, misc ribbon, Burgundy and Ruby Slippers Stickles. Mojo Monday on a Tuesday :). I was able to spend some quality time with my craft supplies in the evening last night to put together something for this weeks Mojo Monday. Chosing between round and square, it must say something about me that I did not even think to try the round one. Does that mean I am square :) This is this week's sketch. One thing I did try to do is mix up the paper a little, another out of my element challenge for me. I love the Wassail paper by Basic Grey, I used three different sheets from the my 6X6 paper pack then embossed green cardstock with the Holly Cuttlebug embossing folder. 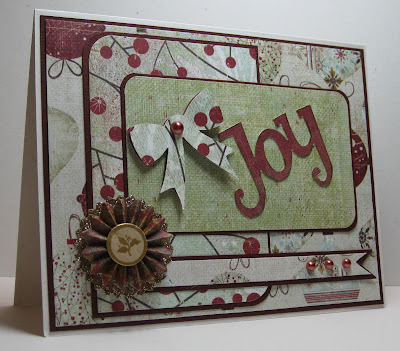 Supplies: Cranberry, craft and green cardstock, Basic Grey-Wassail Paper Pad, Basic Grey Winterland stamps, Cuttlebug-Holly Embossing folder, Spellbinders Circles and Scalloped Circles, white rick rack, dress it Up- Holiday Collection buttons, Ruby Slippers Stickles. Hello Wednesday :) well I guess we are heading into the later part of the evening but that just means I am closer to Friday. Babies Babies everywhere, it seems everytime I turn around someone is having a little one. Welcome Carson. I am still fighting a little with my camera to get a shot that is not too dark, the flash seems to wash the images out, so please humor me while I get that all sorted out. 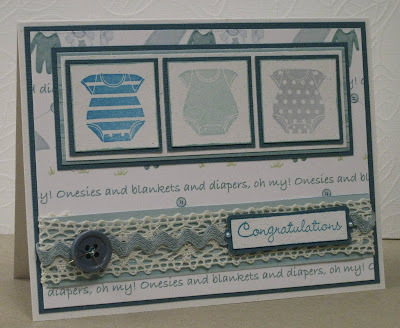 Supplies: Green/blue cardstock, Designer Paper-Nana's Nursery DCWV, There She Goes clear stamps-Bit of Stardust, misc button and ribbons. Kaisercraft pearls. Mojo Monday time...Mojo 161, yes I know it is Tuesday but I made the card last night but did not get the picture taken until today. This card was a true challenge for me, the creative juice has to be squeezed out of me, in the end the card looked simple. This is the sketch. 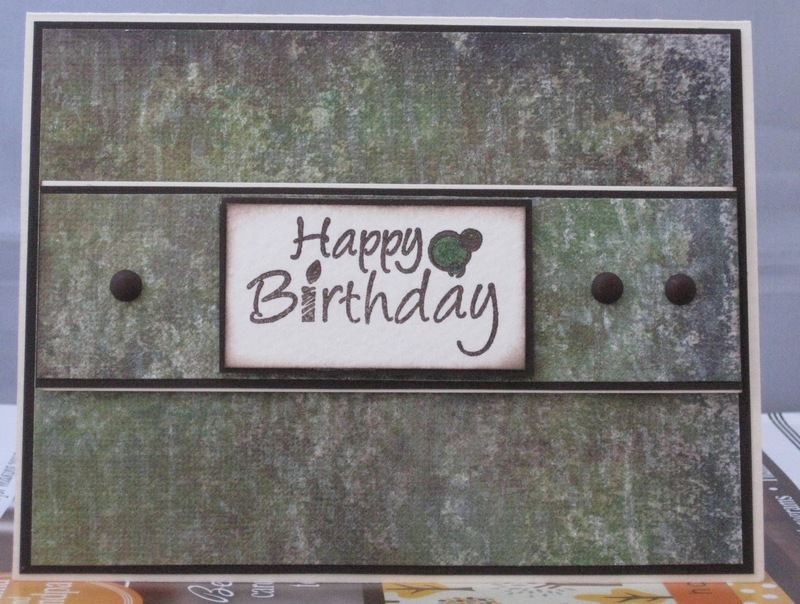 I used Spellbinders Beaded Ovals and Classic Ovals Large to die cut the frame for Happy Birthday, the oval was a little bigger then hoped and I need to us my little sanding block and scissors to trim it a little(which is why it is a little rough) then stamped Happy Birthday. I don’t have any tiny tags that would follow the sketch so I used a little charm. I went crazy at the bead store one day last year and found a good number of cute charms but I have not really used them. 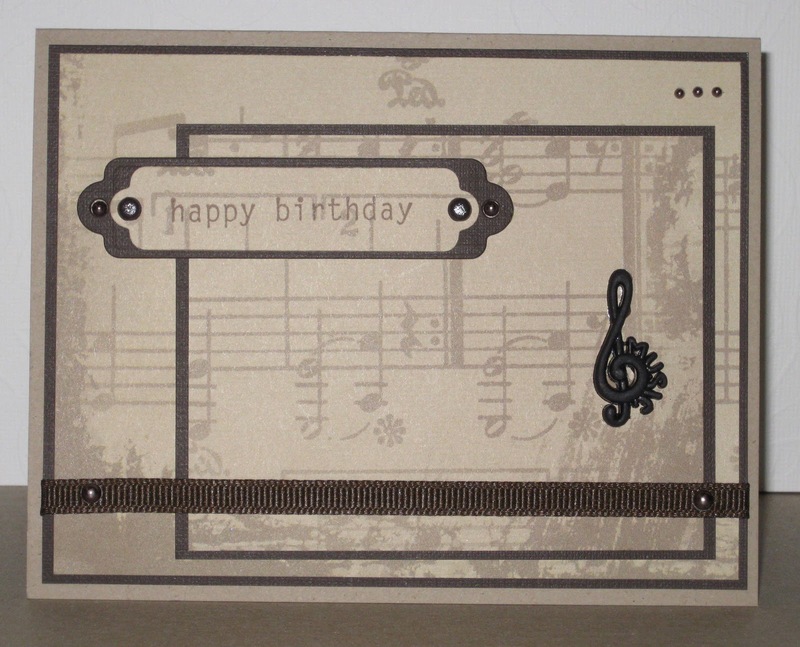 Supplies: Sage and eggplant cardstock, Designer Paper-Basic Grey Cappella pad, Fiskars- Birthday Party, misc ribbon and charm, Spellbinders Beaded Ovals and Classic Ovals. I attended a great event this past weekend, Stamp’in Island Style hosted by Kim Teasdale and Angela Thomas up in Nanaimo. There were some very talented ladies doing make and takes and sharing card making tidbits. I forgot half of my projects in a bag on one of the tables so I won’t be able to post. I did manage to remember to put one in my bag though so I will post that later. Thank you to the hostesses for such a great a event, I had a fabulous time. Happy Wedneday, well I guess we are almost done with Wednesday but there is still a smidge of daylight out there. I have been taking a Watercoloring with Tombow markers, I have a ton of markers and thought this online class would be the perfect way to learn to use them. The class is at My Creative Classroom, the instructor is Kim Teasdale. Kim makes the most amazing cards. I have been invited to Stampin' Island Style this weekend and Kim and a few other master card makers will be there, I am very excited. So this Elegant Lilies was my assignment from last night. The image does not show it but the cream designer paper has iridescent glitter all over it and make is sparkle. I added iridescent string to the ribbon to match. Supplies: Cream and blue cardstock, Designer paper-K&Company Florence Glitter Paper, The Artful Stamps-Elegant Lilies, Craft Essentials-ribbon, iridescent string.